StimPlan can be used for real time data acquisition in several ways, but all methods require that the data be “converted” by another computer. That is, StimPlan does not directly connect to pressure transducers, densitometers, etc. This discussion here is dived into two parts – where the data might be coming from, and how to get this data into StimPlan. 09:12:22 4212.12 24.33 6.17 4.71 20.01, etc. 09:12:23 4218.34 24.21 6.24 4.84 20.12, etc. and, of course, you will need to know (in advance) what each column of data represents. Every “N” seconds, StimPlan will then sample this file for new data, and if new data is present it will be imported. Note that in this example, data appears to be arriving at one data point per second, but say that StimPlan is set to check this file every 20 seconds. This is not a problem; StimPlan simply imports 20 data points at a time. For direct computer-to-computer data transfer, currently the most common method is via a “COMM:” or “Serial:” port. On the back of the computer, such a port will look like the red circled connection in Figure 1. A male connection with 9 pins (a DB9 connector). Serial data transfer for accessories (printers, etc.) is less used to day, so some computers donot have Serial ports. In that case, a USB to Serial Converter (along with the appropriate driver CD) will be needed to convert a USB port into a Serial port. to an ASCII file line at a time. Details of this can be found in the Windows Help. 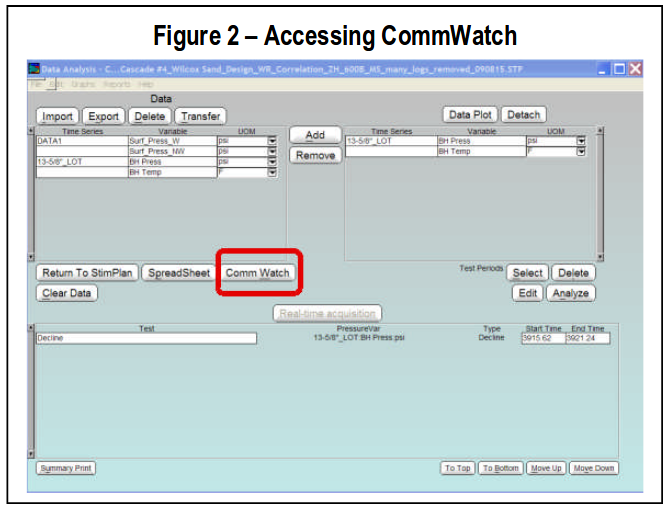 Within StimPlan, there is also supplied utility “CommWatch”. 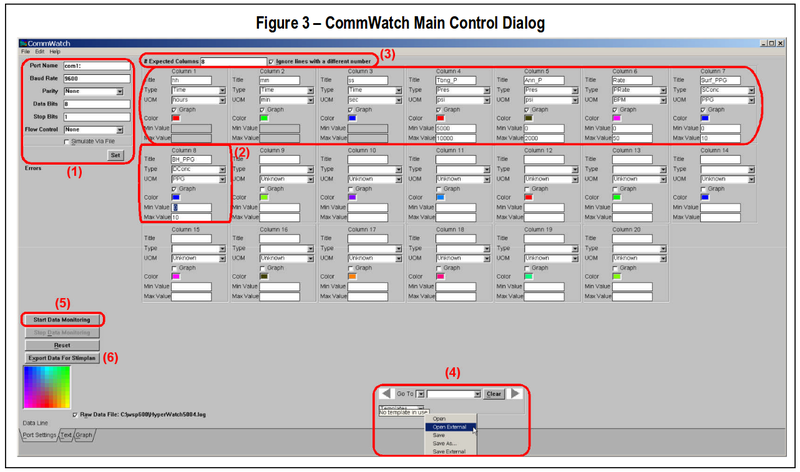 CommWatch is accessed from the Pressure Analysis dialog pictured in Figure 2. To begin a direct computer-to-computer data acquisition, this would then be the first step, run CommWatch. 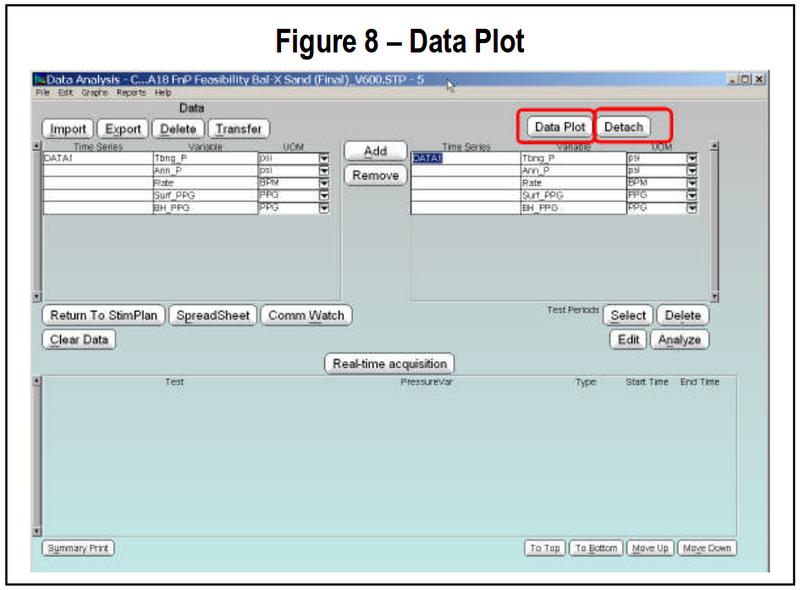 This data acquisition program then opens to the dialog seen in Figure 3. These are log files from previous data acquisitions; the answer here is virtually always “Yes”. • Settings for Serial (COMM) Port (1) – The first step is to set the communications settings for the receiving serial port (top-left). 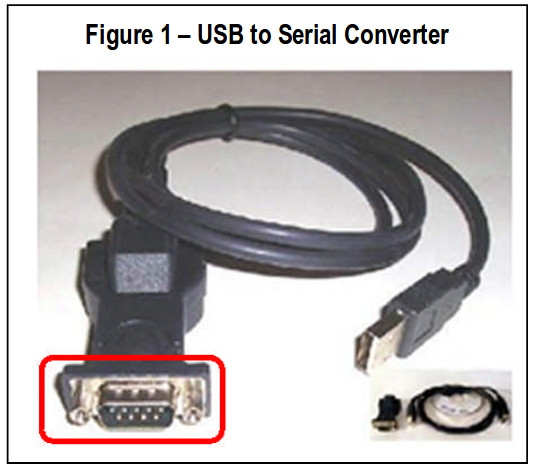 If the serial data port is built into the computer, this is almost always “COMM1:”. If this is not the case, or if a USB Serial Converter is used, Window’s Device Manager can be used to locate the active “COMMx:” port. The remaining 5 settings must be supplied by the “sender”, though the default values (9600, None, 8, 1, None) are very common. After the desired inputs are specified, click “Set” to apply these settings. (3) . Optionally, a choice can be made to reject the entire line of data for any line with more than 8 numbers, or to accept such lines of data and only read the first 8 values. Most often, “Ignore Lines” is selected to minimize chances of “noise” contaminating a data stream. Finally, note the “Min”/”Max” values. These only refer to the expected range of the data, or the range that will be plotted in the “Graph” tab (at bottom). This produces a scrolling Variable vs. Time Plot of all recorded data, as fast as the data is received. • Templates (4) – If desired, all of these settings can be saved as “Templates” for future use. In this case, no template has been imported so no template is currently in use. Thus, one could: “Save As” – This saves the setting in YOUR graph preferences file. This is then recalled using the “Open” command, but is not readily available for other users. “Save External” – This saves the setting in an external ASCII file that can readily be shared. The actual settings are then saved/opened using the standard Window’s file dialogs. 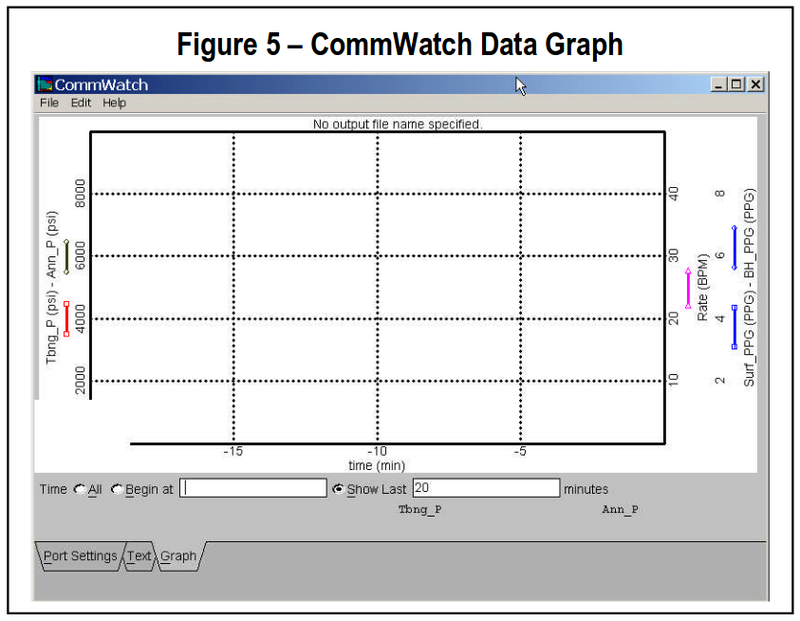 • Start Data Monitoring (5) – Selecting “Start Data Monitoring” causes CommWatch to start reading the serial port, if data is received, it is written to the “Text” tab (see below) and plotted in the “Graph” tab. It is also stored locally (within CommWatch) for later transfer to StimPlan. Note that ALL data received after “Start Data Monitoring” is saved within CommWatch until “Reset” is selected or the program is closed. 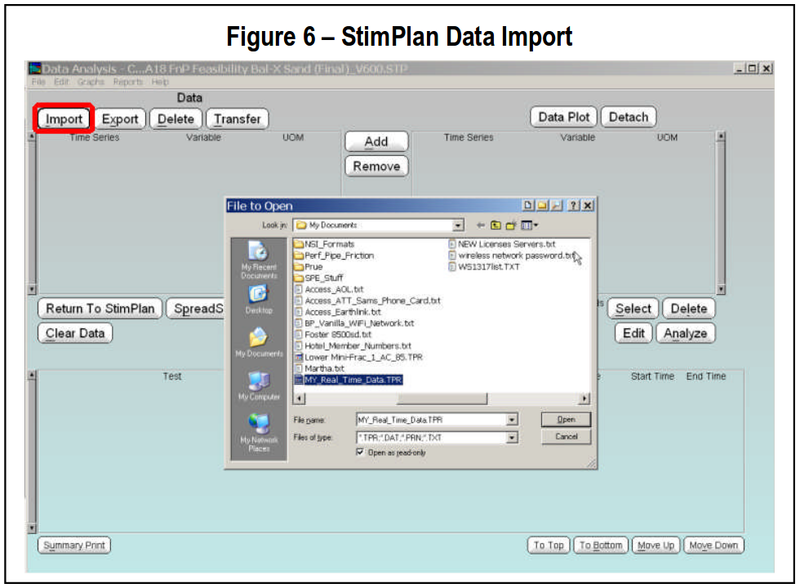 • Export Data (6) – When ready, “Export Data for StimPlan” will create a file (using the normal Window’s file dialog), and will write all of the data recorded since “Start” was selected into that file. Data will then be added to that file once/second, or once per two seconds, or whatever. 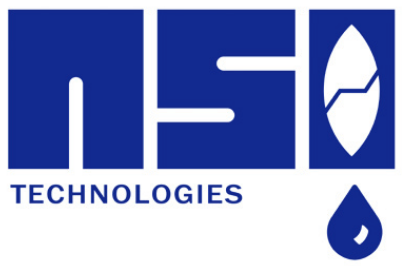 As fast as data is received – it is added to this ASCII file. By default this has a “.TPR” (Time. Pressure/Rate) extension, and if that extension is maintained, the data file will be written in such a manner that StimPlan will automatically recognize the data and know that time has a format of HH:MM:SS in columns 1, 2, & 3, etc. When done, the “formal” path to stop Data Acquisition would be to choose “Stop Real Time Acquisition”, then “Alt-Tab” to CommWatch and choose “Reset”, and then finally exit CommWatch. Alternatively, one can simply exit CommWatch. There are two data displays in CommWatch. First the “Text” tab (at the bottom-left of the window). 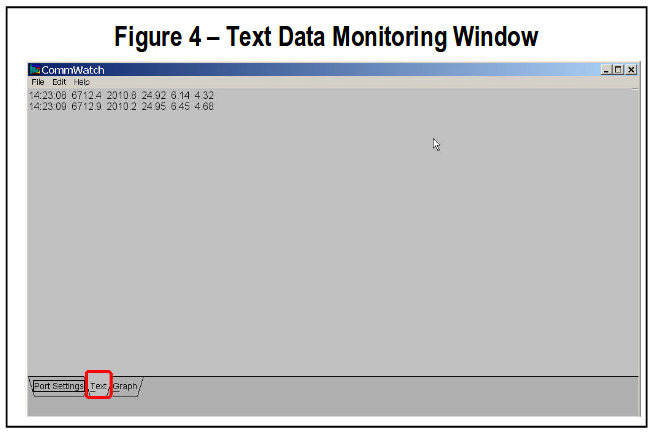 If “Text” is selected, the text monitoring window opens as seen in Figure 4. As lines of data are then received via the Serial Data Port, they will be printed and will scroll down on this window. The second display is the “Graph” tab (bottom-left of window). As seen in Figure 5, this produces a scrolling display of the data is it is received. 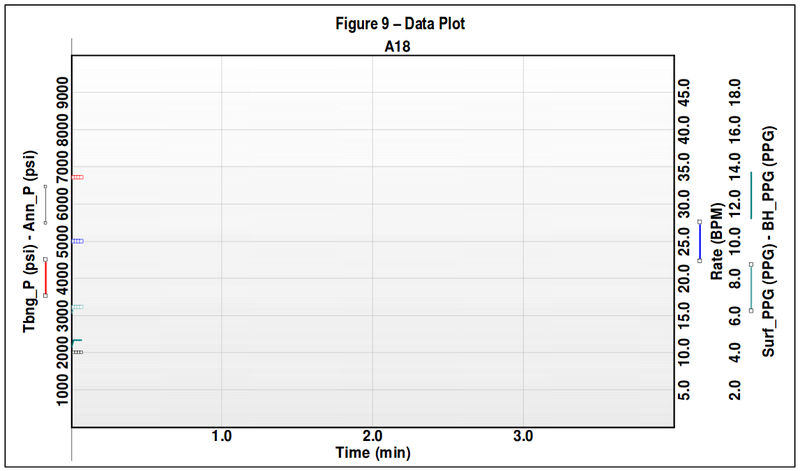 In this example, the plot is set to scroll with time always displaying the last 20 minutes of data. This graph is controlled by choices for each variable in the CommWatch main window. Some mechanism is creating an ASCII data file with incoming real-time data. This could be an In-ternet portal of the pumping company, via a serial data port & CommWatch, or using Window’s HyperTerm and receiving data via a phone modem. To StimPlan, it does not matter how this ASCII file is being created, how often is data being added, or even if this is a “Real-Time” acquisition or a postfrac import. All procedures within StimPlan are basically the same for realtime data import/analysis/simulation as for a post-frac data import/analysis/..... The only difference is small changes in the Data Import process. After opening the Pressure/Rate Analysis Module from the main StimPlan window, the first step is to select Import (top-left) (Figure 6). The desired file is then selected using normal Window’s file dialogs. 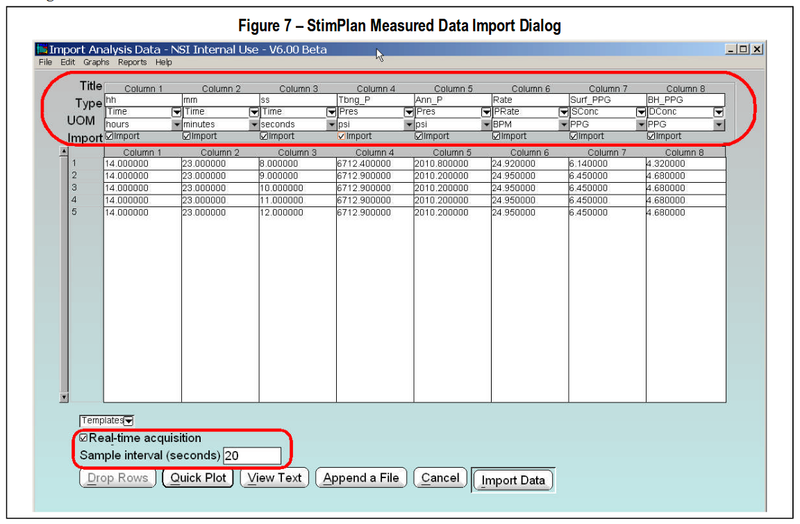 This opens the Import Analysis Data dialog as seen in Figure 7. For a real-time acquisition, this option is “selected”. Then, a sample interval must be specified. If recording pre-frac test data real-time, this should normally be set to something like 10 or 20 seconds (this allows reasonable analysis time between bursts of data acquisition). However, NO DATA IS Figure 5 – CommWatch Data Graph Figure 6 – StimPlan Data Import Page 5 of 6 LOST. If the incoming data is once/second, and this Sample Interval is set for 10 seconds – that simply means 10 new data points will be imported each time StimPlan accesses this file. StimPlan is then used as normal to analysis pre-frac data, history match recorded pressure data, develop a final design, etc. In the background the data is being imported every 10 seconds, but that in now way changes how StimPlan is used. If real-time data is simply being monitored, the sample interval can be set to 1 or 2 seconds. Also, this can be changed later from within StimPlan (in the Pressure/Rate Analysis module). • “OK” to exit the Data Plot, and then re-enter. This forces a new auto-scaling. The example below shows an example where data acquisition is just starting. Multiple graph windows can be creating using “Detach” (see Figure 8). 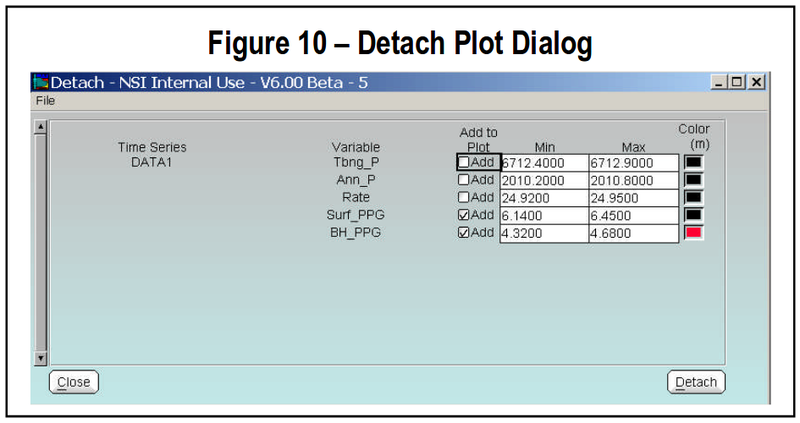 This opens the dialog in Figure 10. In this example the two proppant concentration variables have been selected to be displayed in a separate plot.